A fun strategy game marred by a lack of multiplayer. Hudson Soft revived its TurboGrafx-16 classic, Military Madness, bringing the game back for a flawed but good romp on Xbox Live and the PlayStation Network. 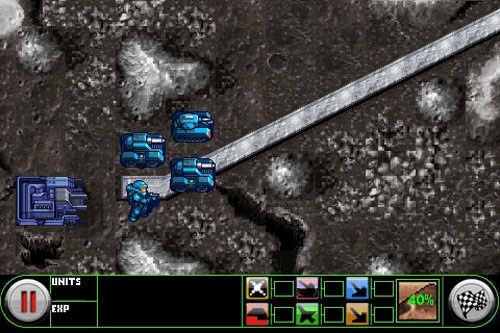 Last week, the company brought it to both the iPod Touch and iPhone, allowing users to guide their armies around the moon wherever they please with Military Madness: Neo Nectaris. It's not bad, but a sorely missing feature kills the momentum. Like all good strategy games, Military Madness requires you to achieve a balance between offense and defense. You'll need to keep your tanks and battle units from being destroyed by the enemy, while at the same time putting them in position to deliver a counterstrike. Learning all this stuff takes a little while, especially if you're a newcomer to the series. However, once you figure things out, you'll destroy the opposition in no time across 48 stages. That said, there are a couple of limitations. First, the battles take a while to play out. Both you and your rivals' units slowly execute attacks, which is exhausting when all you want to do is win. If you muster a little patience, though, you'll be fine. Second, you can't see the entire battlefield at once. There are times when you'll need to manually scroll around to see where everything is. A "see all" option would've been convenient. The biggest setback, however, is the lack of multiplayer. You can't hook up with a friend, not even for a quick Bluetooth-enabled fight. That's a shame, because a game like this thrives on human competition, rather than facing the same old computer opponents. That's not to say it isn't without value, but Hudson Soft missed a great opportunity. Fortunately, the game still looks and sounds good. Despite the limited view, Military Madness resembles its classic TurboGrafx-16 predecessor, complete with an easy-to-see battle grid and cool atmospheric details on the moon's surface. The vehicle animation is equally well done, despite the time it takes to unleash an attack. We're also big fans of the music, a collection of retro-themed songs nicely remixed for the iPhone. On that note, there isn't much to the sound effects, but they serve their purpose. 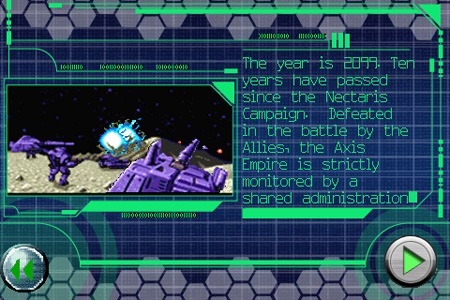 Military Madness: Neo Nectaris is a solid on-the-go effort, one that pays tribute to the TurboGrafx-16 games while delivering 40 plus missions of strategic touch-screen bliss. Still, this Madness needs the option to challenge a friend or see the entire map at once. That said, an update is in order. What's Hot: Graphics and sound stay true to the original game's design, plenty of unique strategies to learn and exploit. What's Not: No multiplayer, you have to scroll around the screen to see the entire battlefield, gameplay takes a while to figure out, animation moves a little slow.